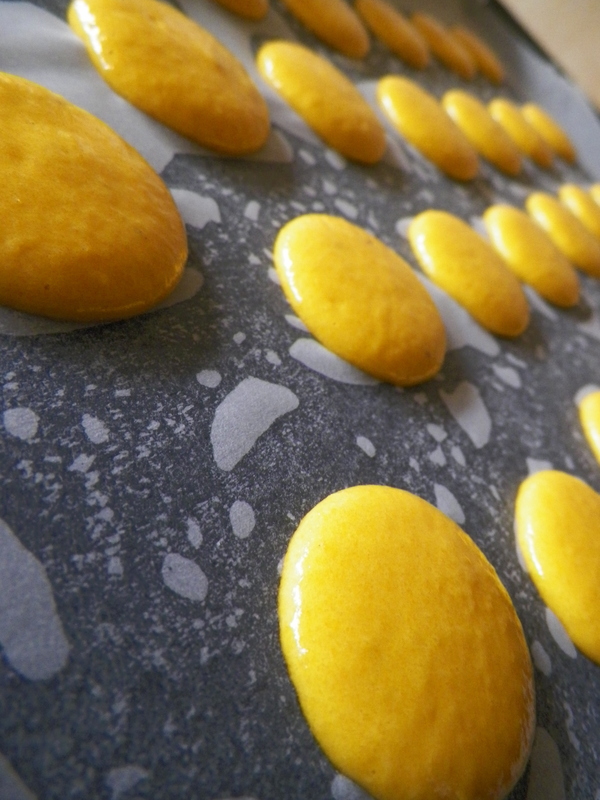 I have recently floated off cloud 9 which consisted of a week in pastry paradise. It was hands down, one of the best weeks of my life so far. For a very long time, I have been almost obsessed with Paris, for reasons fairly obvious, even having never been there. So, to actually be there and see the sights right in front of my eyes was pretty amazing for me. 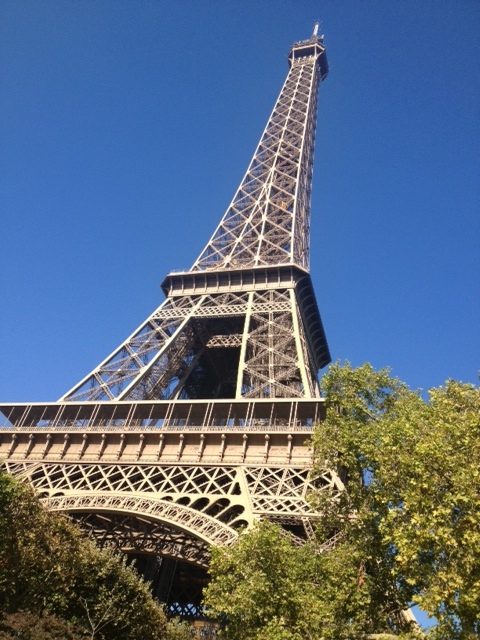 I had a little bit of a heart attack the first time I saw the Eiffel Tower! Now, to the food. We were really lucky to have snatched up a great little studio apartment in the bustling neighbourhood of Bastille (for Melbourne people, this would probably be the equivalent of Fitzroy/Brunswick), which was just to the east of the city. We could not believe our luck when we realised the Bastille Market – one of the biggest foodie markets in Paris, was literally at the end of our street. Winner! 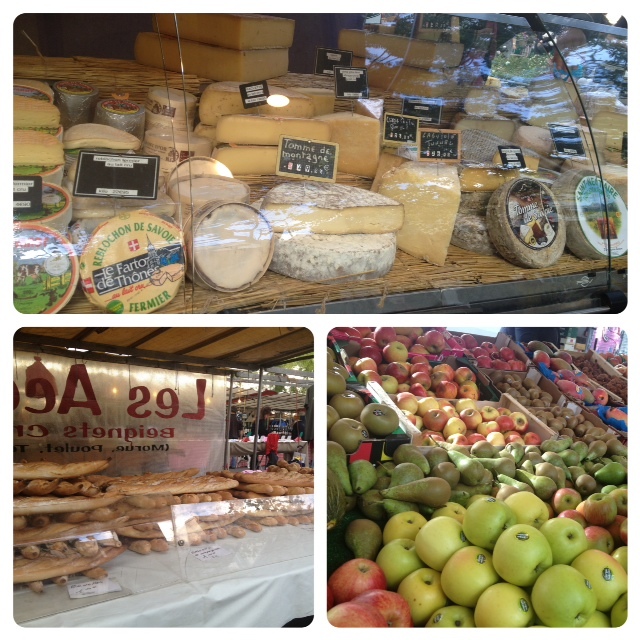 We headed down on a sunny Sunday morning to find delights such as crêpes, baguettes, cheeses, fresh fruit and veg, fresh seafood, curries and souvenirs. The great thing about Bastille is that it is out of the main toursity area of Paris. This means great local restaurants, bakeries/patisseries on nearly every corner, and super-friendly French people – something we were not expecting. We had been told by so many people that the French did not like tourists at all and were quite unwelcoming. These people obviously stayed in super touristy areas in the city that are overcrowded and full of horrible, overpriced restaurants. Out of every country we have visited so far (6), we found the French to be the friendliest, which was fantastic. 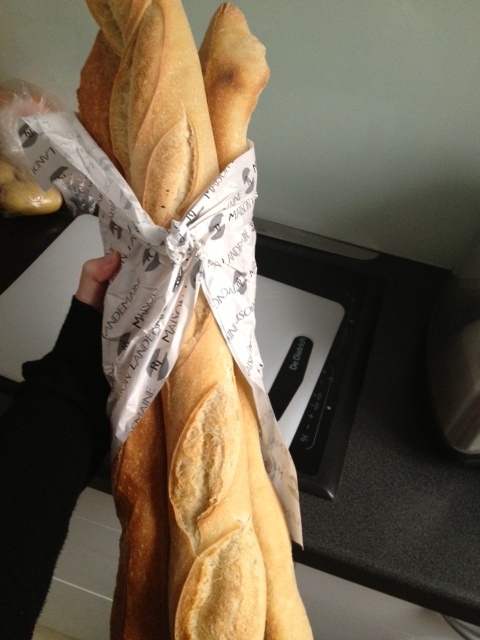 Our local bakery, Maison Laudemaine Voltaire, was our go to each day. It had the best baguettes we had ever tasted, and some pretty amazing desserts and pastries, too. 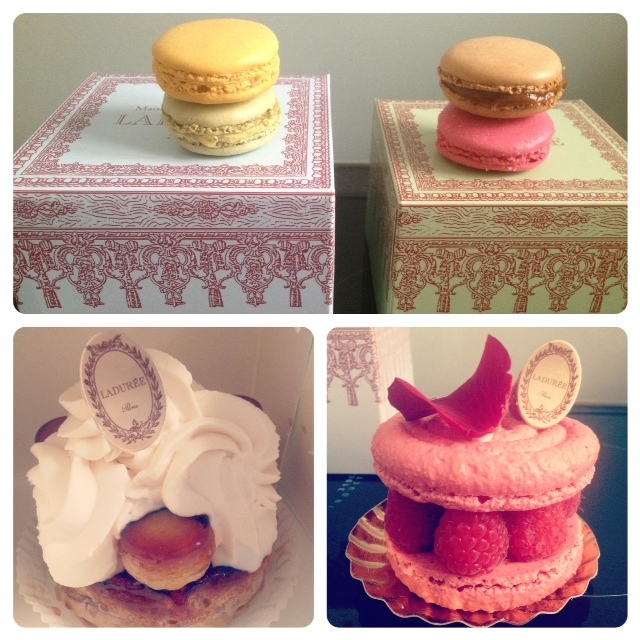 Two places I just had to try in Paris were, of course, Pierre Herme and Laduree. 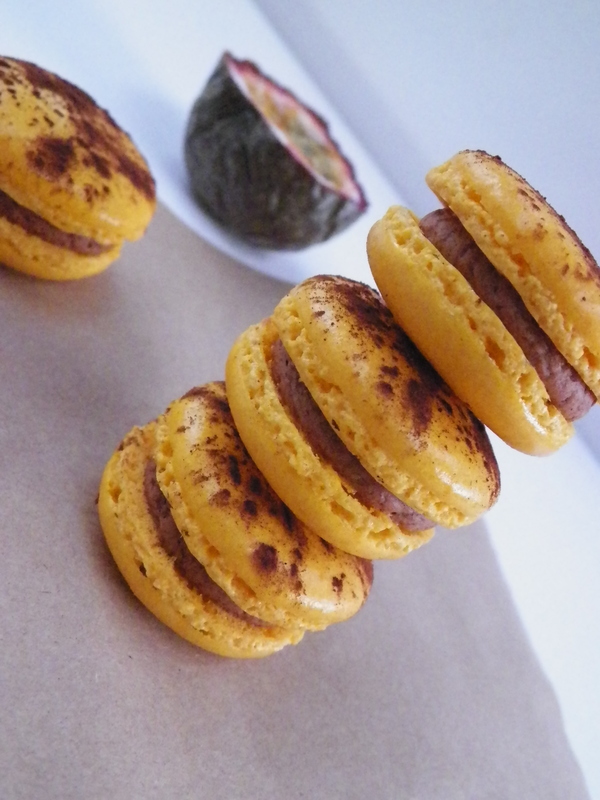 If you are not familar, they are both extremely well known around the world for their macarons and pastries (Pierre Herme also has amazing chocolates). 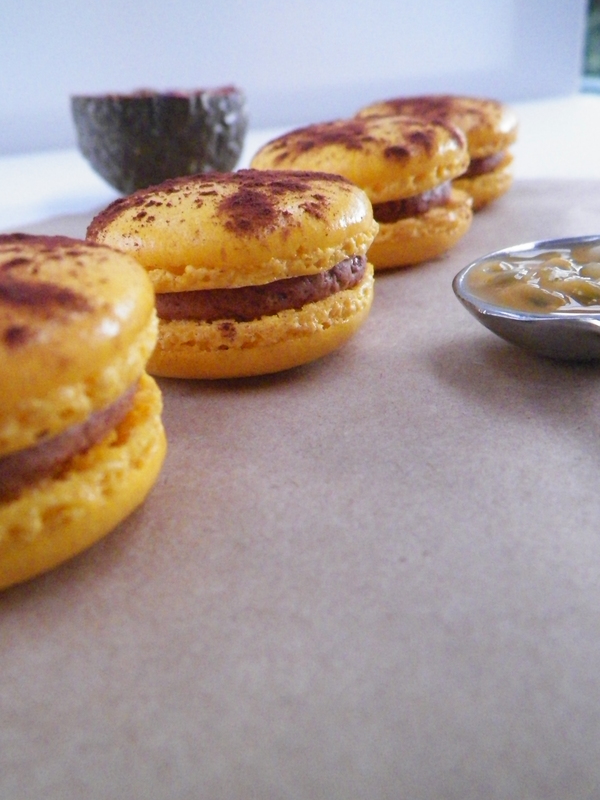 I can safely say that I had the best macarons in Paris, which really is not a surprise at all. For me, Pierre Herme won by a mile. 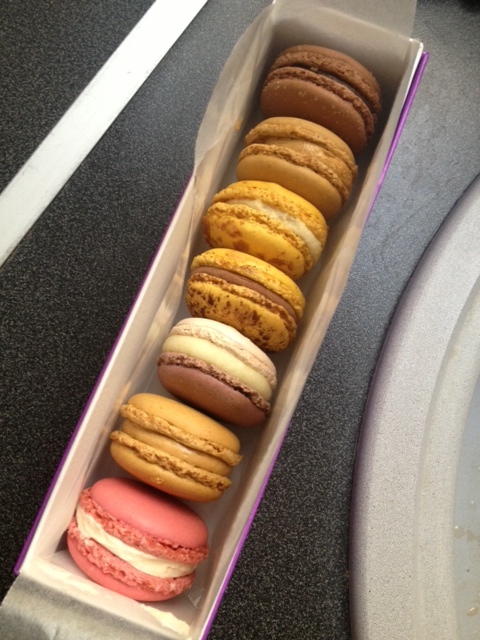 We bought a box of 7 macarons (we couldn’t afford any more! ), and we were both in heaven. The flavours we chose included Salted Butter Caramel, Chocolate Passionfruit, Citron Praline, Rose, Violet Yoghurt and Giandjua Chocolate. My favourite flavour was Violet Yoghurt, and I think it was because I was not expecting it – it was such an interesting flavour, but so delicious. I will definitely try to create this flavour when I get home! 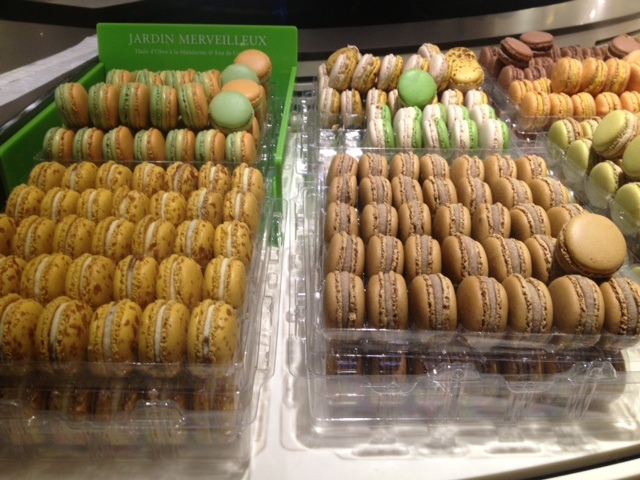 In comparison to Pierre Herme, Laduree’s macarons were unfortunately a bit disappointing. 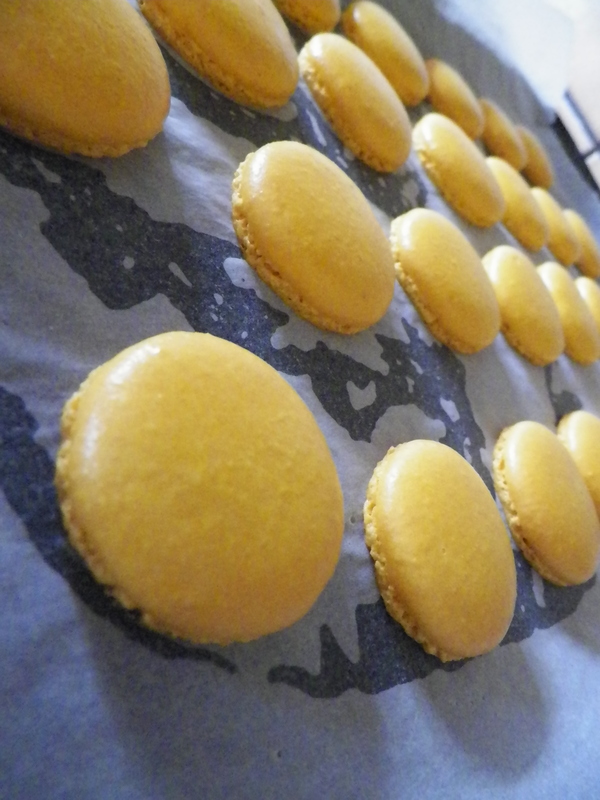 The flavours were pretty standard, but the fillings were quite runny – they just didn’t have the same finesse (sounds wanky I know, lol) as Pierre Herme. The pastries on the other hand, were amazing. We got a Saint-Honore Pomme Facon Tatin – which was a bit of take on an apple tarte tatin. It had this amazing caramelised puff pastry with tiny choux filled with salted caramel, caramelised apples and caramel chatilly whipped cream. Wow! 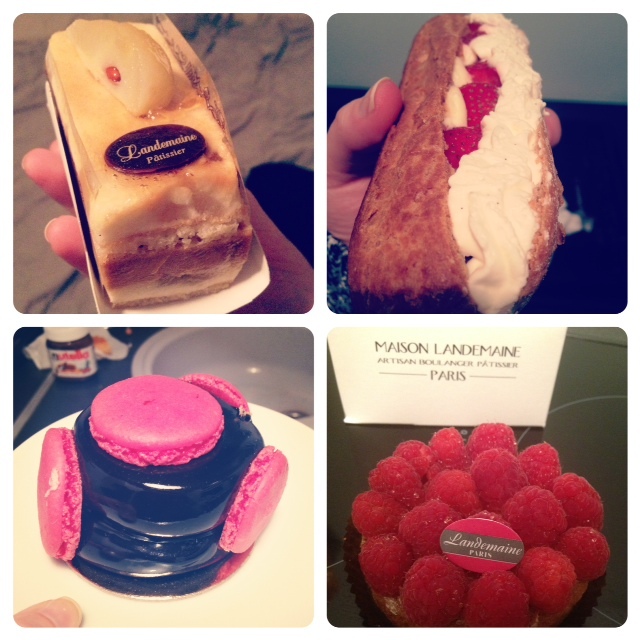 I also had something I had been wanting to try for a long time – Ispahan. 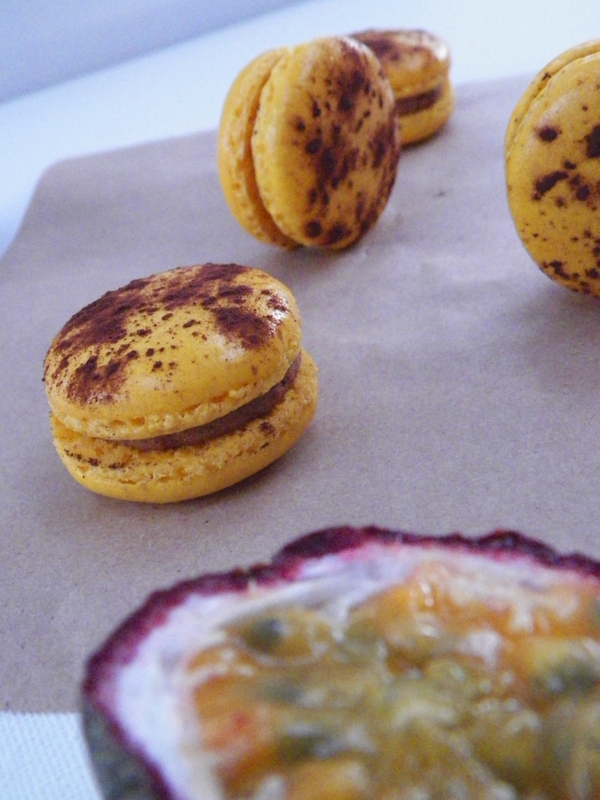 Ispahan is a big macaron filled with rose cream, lychees and raspberries. It was delicious. 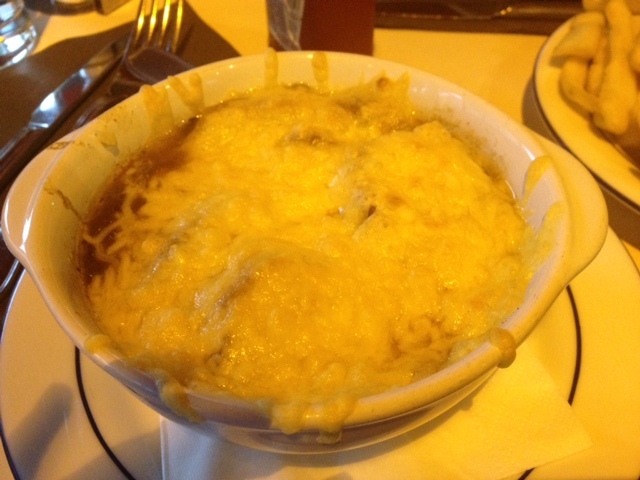 Finally, I also had my first French onion soup experience. It was definitely as magical as I imagined it to be!! It was so yummy, and was complete with gruyere croutons. Another one to try when I come home!